Guitar Lessons at Beautiful Feet Studio are structured as private 30 minute lessons and are offered in the same location as our dance & fine arts classes for your family's convenience. In our faith-based culture of love, your child will receive engaging personalized lessons from an enthusiastic and qualified instructor every time! Our beginner level guitar lessons will help the introductory student master proper finger placement, develop rhythm in strum patterns, understand basic music theory, and ultimately become familiar with their instrument by practicing songs! For our guitar courses, we do require the student to own or at least have frequent access to a 6-string guitar and tuner (there are numerous free tuning apps that work very well!). We strongly encourage our students to practice between sessions, and regularly schedule daily repetition for homework. Members are required, after their introductory class, to purchase the printed curriculum suggested by the instructor before the beginning of his or her second lesson. Justin Chavez has studied Music Education, Motion Graphics, and Photography at Lamar University and The Art Institute of Houston. Growing up in a home of church leaders, Justin has more than a decade of worship leading experience. 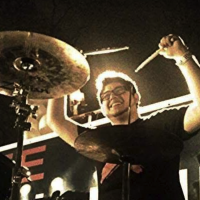 He also traveled around the U.S. in a Christian rock band called 3 Point Crossing serving as the drummer for almost 4 years. Justin has a passion for the youth and is excited to help your child grow to his or her fullest musical potential! Guitar Lessons at Beautiful Feet Studio are structured as private 30 minute lessons and are offered in the same location as our dance & fine arts classes for your family’s convenience. In our faith-based culture of love, your beginner level child ages 6 and up will receive engaging personalized lessons from an enthusiastic and qualified instructor every time! Our beginner level guitar lessons will help the introductory student master proper finger placement, develop rhythm in strum patterns, understand basic music theory, and ultimately become familiar with their instrument by practicing songs! For our guitar courses, we do require the student to own or at least have frequent access to a 6-string guitar and tuner (there are numerous free tuning apps that work very well!). We strongly encourage our students to practice between sessions, and regularly schedule daily repetition for homework. Members are required, after their introductory class, to purchase the printed curriculum suggested by the instructor before the beginning of his or her second lesson.